This piece of gear was first developed as a valid substitute for the bigger sized knives. These bigger ones can’t be carried legally everywhere for once, and they also can’t be as easily hidden. On the other hand, the best neck knife is one that’s small enough, but still sharp enough to do what its bigger bladed counterpart can do. This may be a good idea, but putting it in practice has its ups and downs – we’ll take a look at those in this article, as well as give you an idea of what the topnotch items on the market are. There are a few advantages and disadvantages to knives that can be carried around your neck, and if you want to buy such an item we’ll try to help you by first listing both the pros and the cons. 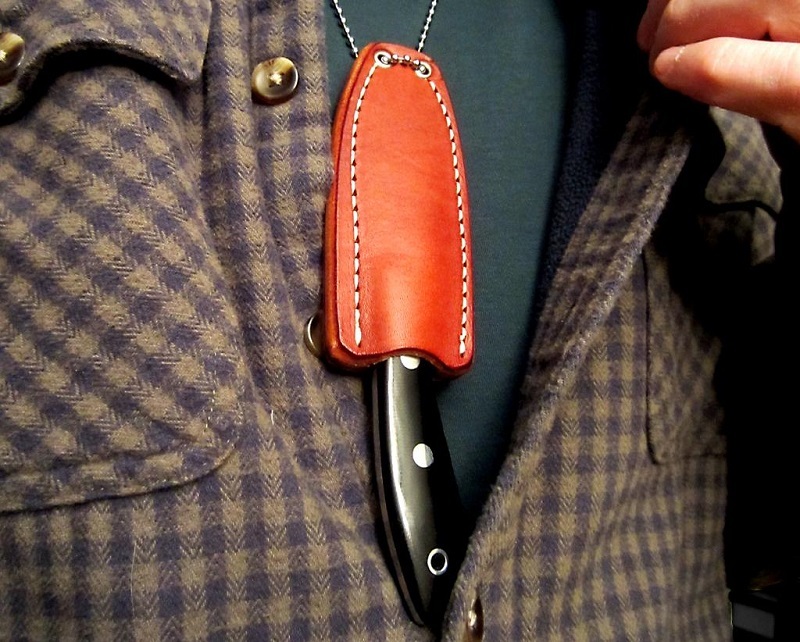 The best thing about neck knives is that you put them on a bead chain or cord, and simply place that around your neck without having to worry about finding the best belt attachments or keychain to secure the knife on. 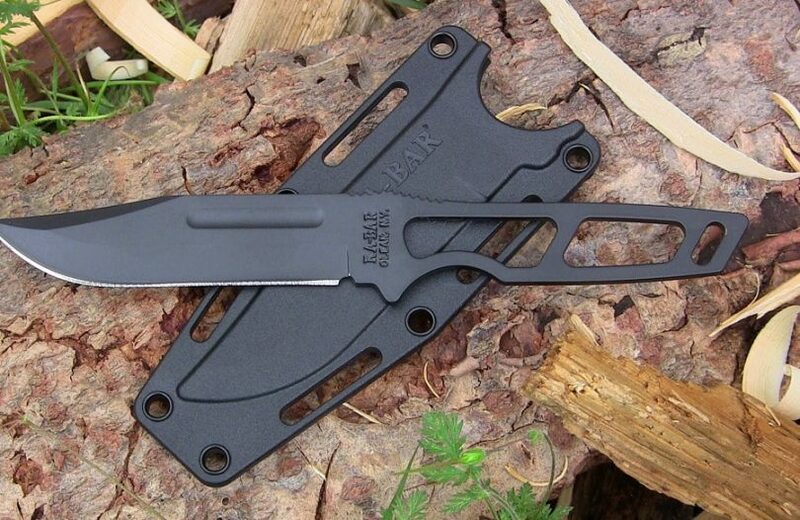 Besides, if you frequently find yourself leaving the house without taking the knife with you, an easy to carry neck knife could be a good solution. Sometimes it can be quite problematic to find a knife you’ve tied to your belt or one you’ve placed in your pocket, and you may not even remember which pocket it’s in. Imagine having to stand up and pat all your pockets or even emptying them before finding the knife. But a neck knife is easily accessible, even if you’re sitting down. If you’re wearing a tie over your shirt, a polo shirt or a jacket, the neck knife will remain hidden and you can use it as you need. Don’t wear a light colored, tight shirt though, or everybody will see your knife underneath it. Running away from an assailant. If you’re on the run from someone chasing you, the bouncing motion of the knife will prevent you from deploying it fast from under your shirt. Being in an accident. If you’ve hurt yourself and are now lying down, the knife can be harder to access. Even if you manage to get on your back, the knife may slip in your armpit area, but the real problem is if you can’t get into a prone position. Moreover, if you’ve been into a car accident, you may roll upside down and can’t grab a quick hold of your knife to try and free yourself with. Do read our article on how to choose the best combat knives for your protection, it’s a must-read! The best use for this sort of knife is self defense: since you can readily conceal it under your shirt – or even in your jacket pocket if you can’t stand wearing something around your neck – it can really help you out when trouble arises. 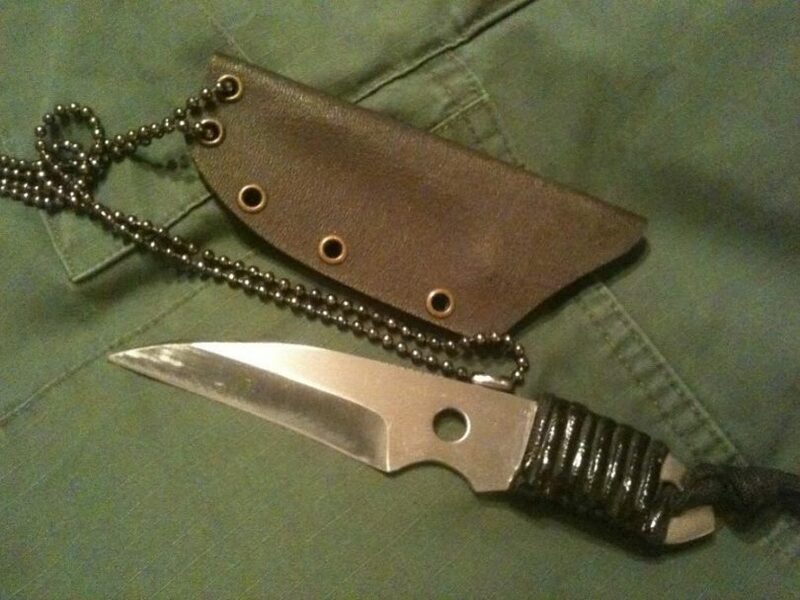 If you’re finishing a late shift and have to walk through a dark alley to get to your car, or if you live in a dangerous neighborhood, a small neck knife can be the thing for you. Take a look at our reviews of the best self defense knife to give you more choices for protection. 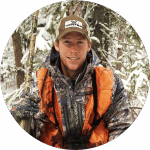 If you’re a fan of these outdoor activities, you can definitely consider a neck knife as a good way to dress out a rabbit or scale a fish. 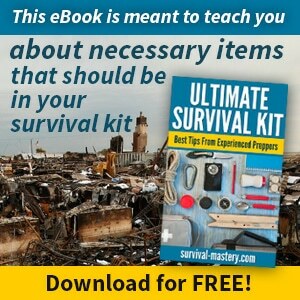 It can also prove quite useful when preparing the equipment for your trip or for when you’re setting camp. Carving wood – leaving messages for your party if you lack phone signal. Maybe you’re at work and you don’t want to go all the way to the kitchen to get a knife for slicing your apple, or maybe the delivery guy is waiting for a fast reply and you need to open on the spot the box, package or letter he brought. Either way, a neck knife can help you be more efficient even as an everyday tool. That being said, it’s obvious that neck knives can be really useful, but you also have to choose a good item if you want it to work. As such, the rivalry between folder neck knives and fixed blades can’t be readily settled without taking into account all their pros and cons. Some good fixed blades can be more compact than the smaller sized folder knives. However, that can come at the expense of handle thickness. If you get a knife which doesn’t have a very thick handle, you’ll have trouble holding it in your hand. Therefore, it’s better to consider the purpose first: do you want it because it looks good on your neck or because you can open letters with it? Then the blade thickness doesn’t count. 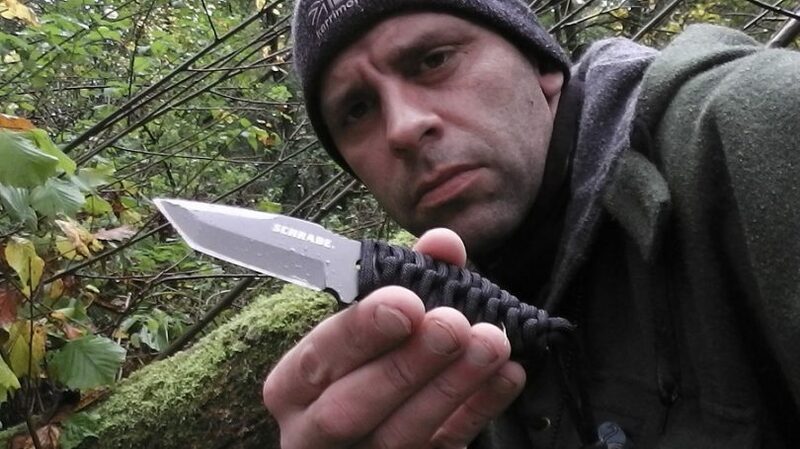 Conversely, if you’re searching for a piece of gear you can use in self defense purposes or when you’re out hiking, then you’d better make sure you can get a firm grip of it, and that its blade is sharp enough to cut at least through rope. Since all neck knives can have this grip problem the worst thing that can happen is discovering this issue when it’s already too late and you’re out in the wilderness with no good weapon to use or tool to cut the stuff you need. However, at this point you can think of customizing the knife and hence making it more useful by wrapping the handle with duct tape. 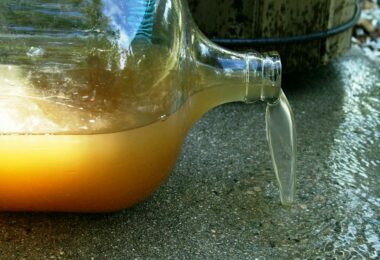 It doesn’t look pretty, but at least you’ll be able to get a good enough grip of its handle. Neck knives such as folders are very accessible, and you can easily slip your hand in your shirt to get to them. But even larger folder knives can be readily hidden, and you can even hang it by a neck sling. Nevertheless, its opening system affects the way you hang the knife, as well as the way in which you handle it before opening and using it. That’s why it’s better to consider folder knives more suited for a tip down carry. In order to have easier access to your neck knife, it’s good to clip it to the paracord neck sling, so that the paracord doesn’t come in front of its handle. Just make sure the neck loop is adjusted properly, so the knife hangs a bit below your shirt’s third button. The fixed blade neck knife can be more easily withdrawn if you leave your fourth button undone or loose, hence there’s no chance of hurting yourself in the process. Besides, collared polo shirts work just as well for neck knives. More to this point, when choosing between a folder neck knife and a fixed bladed one, you also have to take into account your countenance: consequently, depending on your body size, you can get away with carrying a folder knife that has a bigger blade than a fix blade one. Needless to say that the bigger the blade, the bigger the puncture wound or cut. 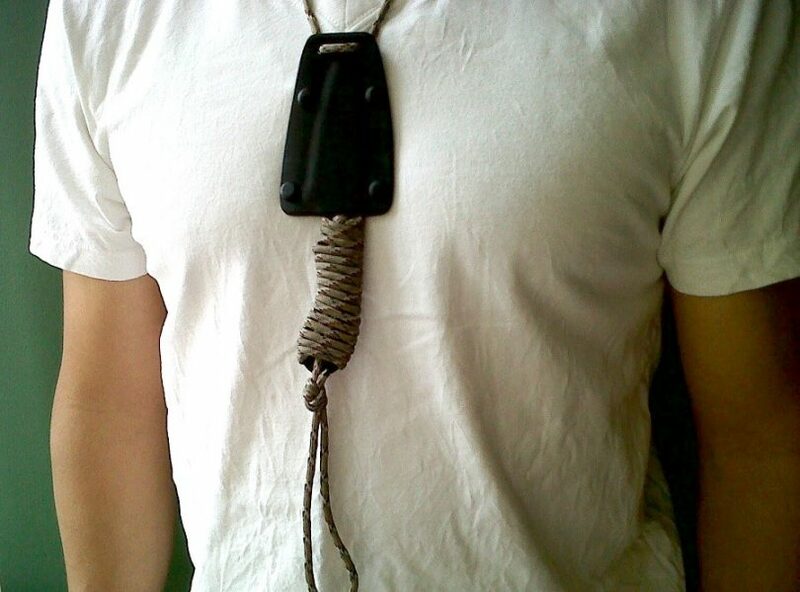 Another thing to consider when opting for a neck knife is how you’re going to wear it: on a piece of cord or on a bead chain. As such, bead chains can easily be adjusted and you can get the proper size to fit your needs, which you can’t do with a paracord. On the other hand, the paracord is more resistant than the bead chain, and you won’t have to fear that you’ll lose your knife after a strenuous activity that might cause the bead chain to break. Conversely, wearing a cord around your neck is quite dangerous in hiking or rock climbing activities, because if you slip and fall you may strangle yourself with the cord. This can also happen in a hand to hand combat situation when you literally have a noose around your neck for your opponent to grab. That’s why it’s better to think in advance about some solution to easily remove the cord from your neck in case of emergency. But if you’re not planning on rock climbing or getting into fights, a piece of cord can feel more comfortable around your neck, since some men complain that bead chains pinch their neck hairs. After you’ve reviewed the advantages and disadvantages of neck knives and have considered which type of item suits your needs more – a fixed blade or a folder knife – it’s time to look over the finest items which can prove of great use and meet your demands. At $7.70, this great MTech product is a compact tactical neck knife with a full tang construction. That means it’s a very sturdy piece of equipment and can easily be concealed around your neck and under your shirt. 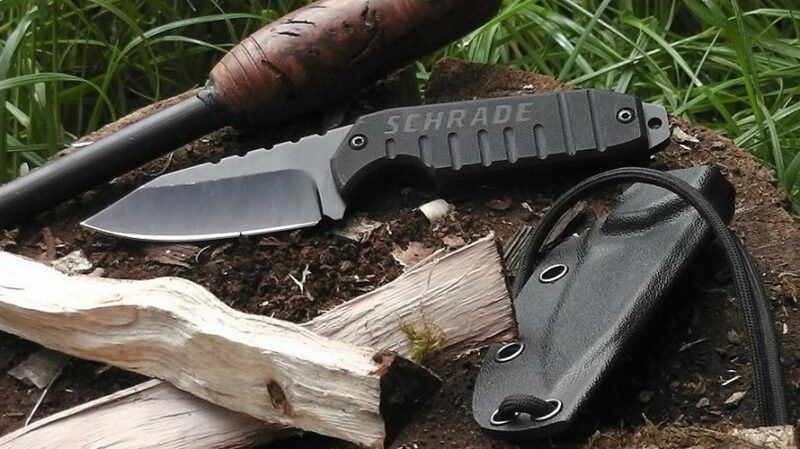 The easy to carry function is furthermore met by its Kydex sheath with a ball chain, which also makes this knife very safe to carry around your neck. Moreover, it has a drop point stainless steel blade with a stone washed finish, which ensures its strength and cutting abilities. Its G10 handle makes it all the easier to manipulate, increasing its strength and making for a secure grip. 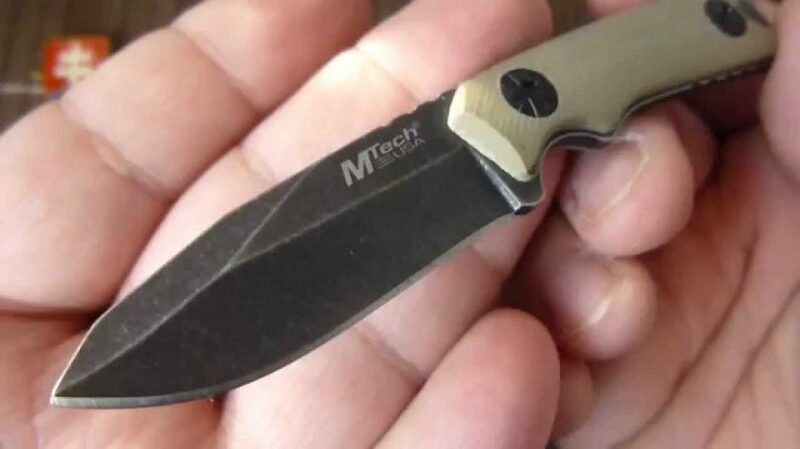 The MTech knife’s dimensions are 4.75 inches overall length, and a 2 inch blade length with 2.8 mm thickness, which accentuates its perfect accessibility and use. With a retail price of $36.89, this black Ka-Bar knife is made in the USA and it’s used extensively by the military and service members. That is a great testimony of its quality, strength and overall use. Being thoroughly tested for an increased assurance of its high quality craftsmanship as well as durability, you can safely use this knife for outdoor activities of any kind, while also being a great tool for collectors. As such, this particular item has a hard plastic sheath and a flat grind which make for a strong grip and easy access. Moreover, the Ka-Bar knife is very light weight, at just 2.25 ounces, and just 7.80 inches long. Not to mention that it can be very easily sharpened after extended use. Costing just $13.99, this Rothco knife can be a great addition to your gear, considering that it has been quality tested to ensure maximum durability. So if you’re looking at making a great investment both quality and strength wise for the long term, you might want to consider the Rothco knife that has been particularly designed for rough uses. Besides, the company itself is synonym with comfort and performance, being a well recognized and trustworthy brand in its category. 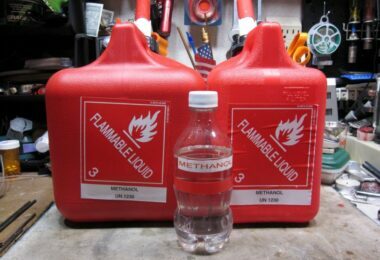 However, keep in mind that its dimensions are 10 x 6 x 2 inches, and it has a weight of just 0.3 ounces, which render it quite small so you may not use it for hunting, fishing or self defense purposes. On the other hand, it’s a pretty safe choice because it stays very well in its sheath and you won’t have trouble concealing it. 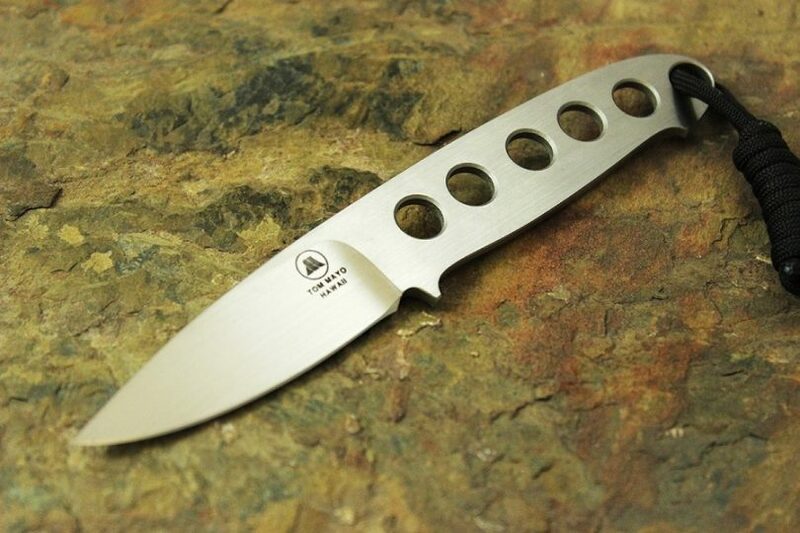 A very good choice when it comes to affordable neck knives, this $8.62 item is made of durable 440 stainless steel. Therefore, you can stay assured that it can be safely used and that it’s very resistant. In point of fact, the MTech USA MT-20-14 Series fixed blade knife is ideal for camping expeditions and survival training, because it’s pretty sharp and you can have a strong grip of its handle. 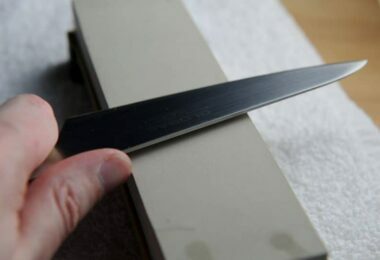 As such, it’s a full tang knife which measures 6.5 inches overall, and it comes with a 2.75 inch double-edge blade. In addition to this, the handle is made out of nylon-fiber injection, which makes it all the easier to grab. Besides, it provides a lanyard hole at its end, which you can either use for hanging or for breaking glass. You can opt for the colors grey or black for the handle, but both models are pretty tough. To sum up with, you’ll also get a nylon fiber sheath with chain for wearing around your neck with the purchase of this MTech item. 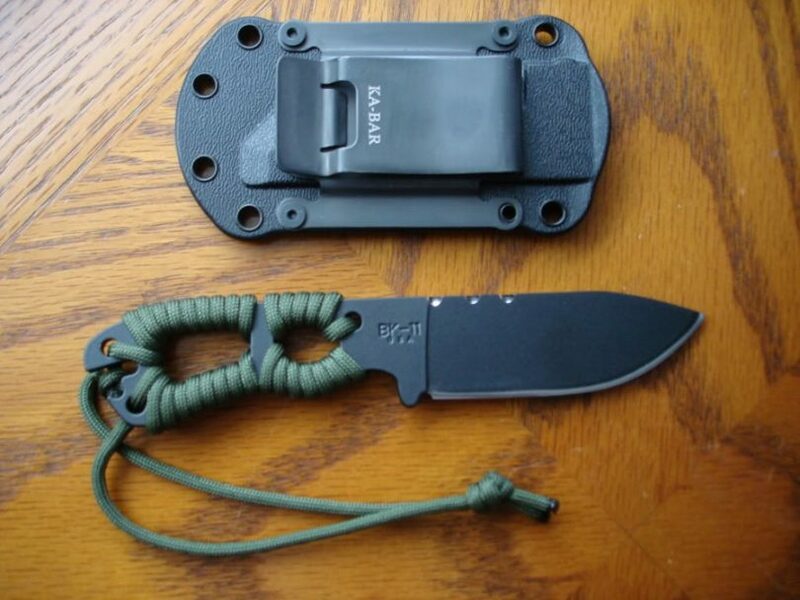 If you’re more interested in a neck knife that can prove a great addition to your camping gear, the $36.27 knife from Ka-Bar can be exactly right for your hiking expeditions. It’s very light since it weighs just 0.15 pounds, so it’s a smart choice of something that won’t bother or dangle around your neck while walking. Conversely, being made out of 1095 Cro-Van steel and thoroughly tested to ensure quality and durability, it can safely be used even for the most difficult camp chores. When purchasing this neck knife, you’ll also get the guarantee of the Ka-Bar Becker brand, that furthermore gets you a good injection-molded, glass-filled nylon sheath, that is compatible with TDI metal belt clip. In addition to this, the 6.75 inches blade length and its shape is perfect for everyday carry, whether indoors or outdoors, and you can do stuff with it that a folding knife couldn’t assist you in. Conversely, the most common complaint about this item is that its handle isn’t suitable for people with larger hands, who have to place their index fingers on the back of the blade to get an easier grip. At just $7.02, this is a great knife that makes its money’s worth but doesn’t really go above that. At 6 inches long and 3.2 ounces heavy, it can still be used with great results for your outdoor activities. Being so lightweight, you don’t even feel it while walking or running. It has a solid and sturdy handle, and the sheath that comes with it is also very durable. Plus the blade is crafted out of a very good steel, and you can trust in its durability even if it’s not the sharpest knife in the tool box. However, it has a needle-like point which is really awesome for piercing stuff. 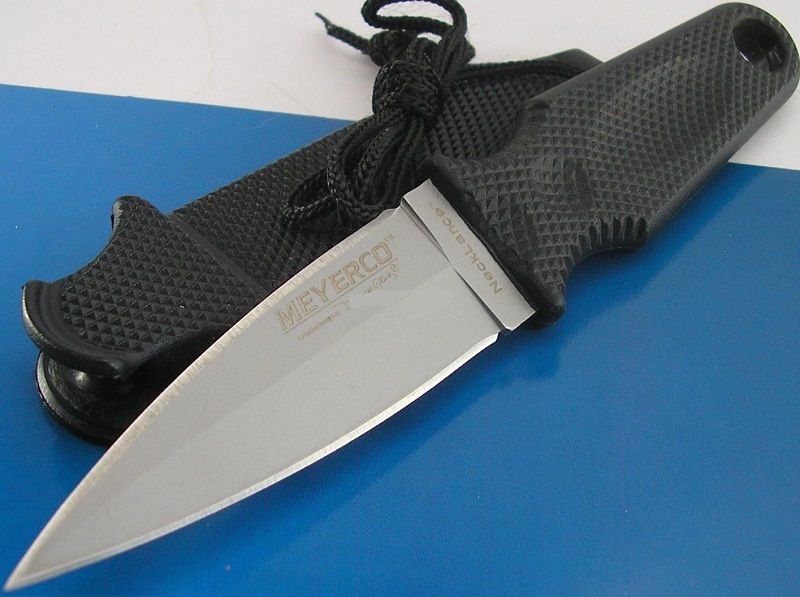 On the other hand, this Meyerco Knife doesn’t allow for a thicker paracord to be hanged on, and it requires using both your hands when drawing it out, seeing as the clip with which the blade is secured isn’t very loose. In addition to this, you should also consider its dagger like design, which may make it illegal in some states. Another neck knife that delivers its penny’s worth, the $6.88 item from Master USA is a 6.75 inches long neck knife, which has a 440 black stainless steel blade, a grey cord wrap handle and a hard plastic sheath with lanyard. When ordering this knife, you can rest assured that you’ll get it already sharpened, although after you use it extensively sharpening it yourself doesn’t pose much problems. Nevertheless, you should only use stuff that works with recurved blades like rods, pocket pal sharpeners or normal bench stones. If you use smith’s diamond stones, you may not sharpen thoroughly the entire blade. Additionally it fits very well in its plastic sheath, and even if it could play a little inside you don’t have to worry about it falling of. 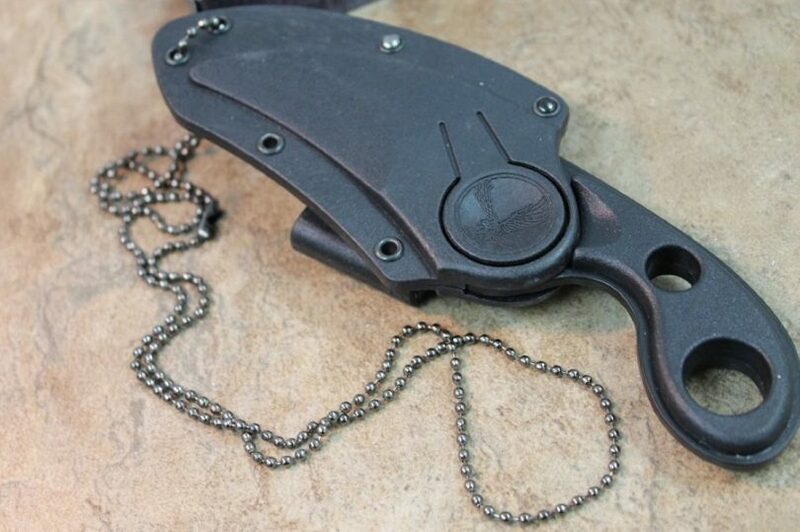 You don’t even have to wear it around your neck if that feels a little too uncomfortable, because it has a clip that allows it to be carried on your keychain, and the sheath fits perfectly in your pocket. Apart from this, the Master USA knife can definitely be used for utility work, as well as for self defense purposes. This $8.59 neck knife from Get is made out of full tang solid stainless steel, reaching an overall length of 7.5 inches. Its blade is 4 inches long, and it’s crafted from stainless steel with a black finish, while the handle is from black nylon and has a metal finger hole. Its overall aspect is pretty tough and intimidating, and you can confidingly use this knife for slashing purposes, even if it can also be used for stabbing in circumstances that demand a good self-defense tool. That’s because these Karambit looking knives have short, but thick blades that are sharpened inside their curve, in order to cut your opponents tendons, ligaments and major arteries, so that you can escape easily if you’re being attacked. 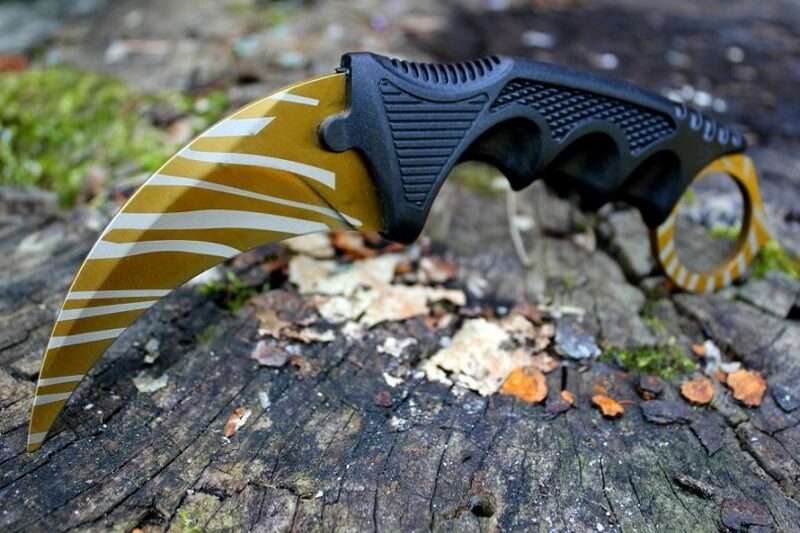 Basically, if you want a good self-defense Karambit style knife, with a hard plastic grip that fits even larger hands – this could definitely be it. That being said, you’ll have to make sure that you’re familiar with the rules and legislations of concealed weapons in your country. Consequently, if you’re not licensed, you may only be able to carry a small folder with you, so that you’re in no danger of being arrested. For example, in Virginia USA the concealed knife can’t have a blade longer than 3 inches and can’t have a fixed blade, or else it would be classified as illegal. This stands true even if you do have a permit for carrying a concealed handgun, and the only places where you’re allowed to have a hidden knife with a fixed blade or one that’s longer than 3 inches is in your own home or at your place of business. So be wary of ambiguous laws you can easily misunderstand, and make sure that the fixed blade knife you’re carrying around your neck is in no danger of being labeled as an illegal weapon. Check out our reviews of the best home made combat weapons to give you more choices.